I have some single player games that I want to skip the grind part and go straight to the end game content. Could I get VAC if the game has no online content? As examples, I got heat-signature and wanted to get more money ingame. However, the new Shadow of War (Releasing on Oct. 10) will have microtransactions to buy chests. The game being offline (maybe with online checks), could I get banned? If you don't see this, then you likely won't get VAC banned. Looking at Heat Signature, it does not appear to have VAC enabled. There are some games that "punish" the player if they cheat (look at Stanley's Parable), but if it's a singleplayer game there is no reason for contacting the server to check if your files are legit and ban you if not. Unless that there is a online leaderboard or something like that. If you are still unsure planning on cheat don't try to use any online feature of the game. You can even block the game from contacting the internet to be sure. Not the answer you're looking for? 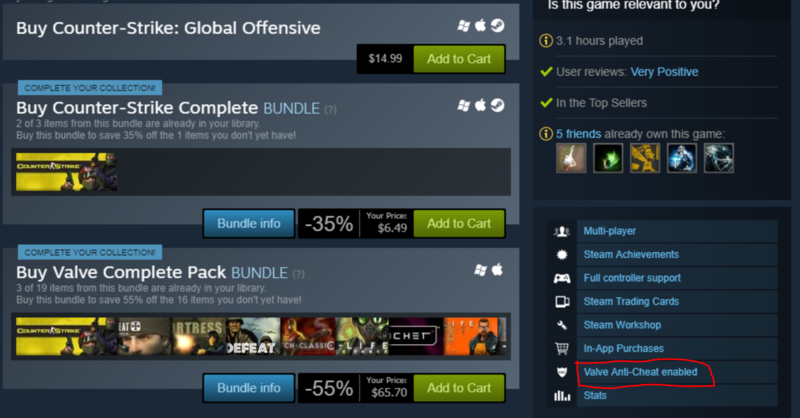 Browse other questions tagged steam cheats or ask your own question. What prevents users from cheating from outside a game? How can I permanently enable cheating? How can I get my Steam Game to Launch?